As we finished our hunt the other day, and were milling about the truck a pickup drove by us and then backed up. The driver said, “Hey, just wanted to let you know I’ve got some traps up there.” We’d walked right past his traps, and of course our dogs did, too. He showed us some curly mylar ribbons he used to mark the traps; the ribbons were tied to bitterbrush and large sagebrush plants. Although it was considerate of him to stop and tell us about the traps, it’s disconcerting to know my dogs could get caught in one more easily than I previously thought. 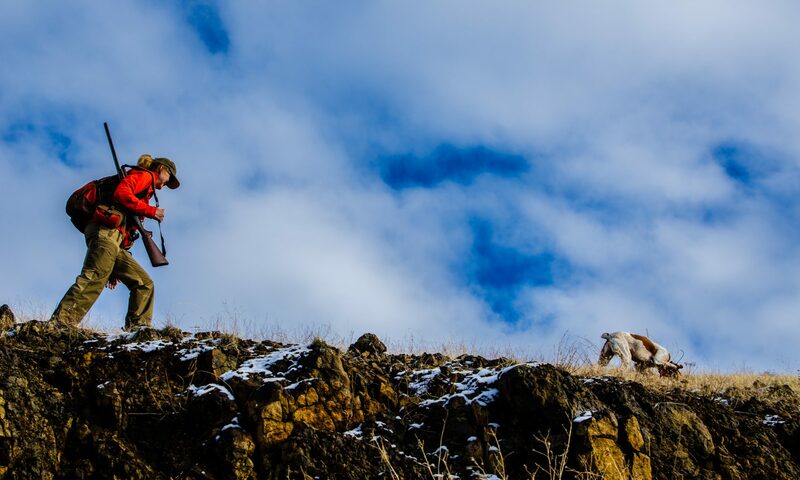 Trappers have just as much a right – according to the regulations – as I do to hunt chukar. I hope all trappers are as considerate as this one was, but I’m not sure they are. I also hope that they place their traps well away from common access points to chukar terrain, which I’m not sure of now, either. The one objection I have to trapping, and trappers’ equal right to trap on public land, is that trapping has the real potential of harming bird dogs, or anyone’s dog while hiking on- or off-trail. My preferred use of this same public land has little or no potential to harm others. So, are all uses of public land “equal”? Regardless of how you might feel about the issue, I found a couple of informative videos from Idaho Fish and Game about trapping that I thought were worth sharing. The first is an overview, and the second shows you how to release your dog from a trap. Hopefully it’ll never come to that, but it’s good information to file away. “Enjoy” (if you can). Back in the 70’s I had one of my dogs caught in a trap someone from the Department Fish and Game had set. No flags or any other type of warning sign was posted in the area. Trappers may have a legal right to trap, but in my opinion they also have the responsibility to not trap a dog. I am not sure how to accomplish both. I have the responsibility to control how and where I shoot. They have a responsibility to control what they catch. Even if a live trap is used the trap must be checked daily to keep from harming a dog. Unfortunately this is only a big problem for the guy who owns a dog. Other people let the question pass. Fortunately my dog was not seriously injured. She did limp for a few days. The traps were clearly marked as belonging to the DFG. I doubt the trapper ever located his traps. I didn’t put up a sign where I left them. That’s exactly what I worry about, Dale. The responsibility seems to lie with the dog owner, not the trapper. Most trappers, from what I understand, don’t mark their traps, so hikers and bird hunters don’t know where they might be; I think F&G should require that traps be marked. And if a guy has a big-running dog and no GPS collar and the dog gets trapped, chances are the dog won’t be found unless the trapper checks his traps daily, which I am skeptical they do. Important post Bob. I had a dog get in a leg hold trap a couple years ago. Luckily I knew what to do, and had a partner to help out. One person to wrap a coat around the dog to control it, the other to open the trap. I think there is a real chance of being bitten by your own dog in that situation. I have also come across a number of coyotes over the years, still alive, caught in traps that obviously had not been checked for some time. In none of these cases were there any sort of signs or markings to indicate traps were in the area. This is so wrong in my opinion, and should be a requirement of trapping, but the state of Idaho doesn’t care. When trapping was enshrined in the Idaho constitution a few years back the state had a chance to require some sort of marking/labeling/signage, but they were too gutless. If you run across such unmarked traps I recommend marking their location by dropping a large rock on them. Really large, from real high. Larry, I totally agree that traps need to be marked. Why trappers aren’t required to mark their traps makes no sense whatsoever. I’d take it a step further and require all trappers to register GPS coordinates of their traplines with F&G, which should post the locations on a resource page so people can avoid certain areas. Of course, if that were the case, nimrods would steal or mess with the traps. But since trappers are “required” (with no enforcement, obviously) to check traps daily, that shouldn’t be an issue. The reality, though, is that few trappers (if any?) check their traps every day, unless that’s all they do for a living. Bob, thanks for writing a thoughtful and neutral post on a sensitive issue. I’ll try and be as neutral. Dog owners have to control their dogs in places such as the foothills above Boise, Idaho, to avoid conflicts with grazing animals and other users. There are traps in the Boise foothills and these have caught dogs. You describe how some uses are more or less likely to enter into conflict, or to endanger other users. You hope that trappers use common sense. No offense to trappers, but an awful lot of users of public land are totally lacking common sense. Let’s look at a hypothetical example. If I am in Boise and my dog mauls some other person’s dog, I am at fault. If a trap on *public* land maims my dog, nobody is at fault. I argue that these laws need to be revised. David, I couldn’t agree with you more. Common sense should be “listed” since its scarcity seems to be accelerating. What would it take to change the law to require trappers to mark their traps? It makes no sense why they aren’t required to do so on public land. As a hunter, I have a difficult time with the trapping issue. I trapped as a kid with my dad, but it was always after upland seasons closed. I also value the need to keep coyote populations in check. But, I love my dogs……..
My only bit of advice is to keep your dogs relatively close. I like my dogs to hunt within 300 yards. At least that way they have a chance. Snares and conibear traps are deadly. You might have 60 seconds. Thanks for the reminder. Traps on public land is a bad idea in general, for a lot of reasons. Besides the burden of threat trappers ask the rest of us to carry, we hunters are expected to abide by fair chase, by-catch, and non-market hunting standards. Why trappers get a free pass on those things is beyond me. Trappers always sell themselves as “hunters”, which is a crock. Obviously there are times when game mgmt agencies should be able to use trapping to address resource issues. But the wanton attitude of most trappers (the gent you ran into Ive found not to be the norm) isn’t consistent with that standard. Divide and conquer remember there are groups out there who would love no more to stop the harvesting of any game taken by any means. We must all stick together or these people will win. In my 25+ years of running dogs I have only run into traps 2 times fortunately with no incident. I just moved out of that aria and never returned. You may say I have the right to be there to and you do but there are millions of acres of public land to SHARE and hunt. A few years back one of my pointers got caught in a tangle of downed barbed wire cut her up pretty good I got her free but not before getting bitten but she was scared. There are lots of hazards out there for the dogs. I’m sure there is a solution to this problem without conflict ( Smashing someone’s property). Maybe a red flag on a 6ft pole at each end of a trap line required in heavily used arias designated by Fish & Game what is your solution? Thanks, James. Good points. Friends who have more experience than I do tell me that trappers are like hunters: most are pretty conscientious about what they do. They also tell me that most trappers don’t set traps until snow’s on the ground, near the end of the bird season (or when it’s nearly impossible to bird hunt, as it is now here). They also say that most will mark the area they set their traps, and that conibear traps are hardly ever used around here because they ruin the pelts. So I feel a bit better. Fish and Game used to require trappers to mark their traps, but people would mess with them or take them, so they removed that regulation in Idaho. Solution to potential conflict or tragedy (having my dog killed or seriously injured by a trap)? Aside from luck and avoiding areas you know have traps in them, it doesn’t seem there really is a solution. I think the non-hunting public do see a fundamental distinction (as do I) between trapping for pelts or predator control and hunting for game that will provide food, so I’m not sure I agree totally with your point that we (bird and big game hunters, and trappers) need to stick together, although I get your point about that; I’m very aware of the groups who virulently oppose any human killing of any animal (we run into this regularly around here because there’s a woman who has a rescued Brittany who believes we’re the devil because we bought pure-bred Brittanys; her car has all kinds of animal rights bumper stickers on it; it’s ironic that her dog is nearly obese, but I don’t get in her face about loving her dog to death by overfeeding…). Thanks again for reading and commenting. I always enjoy your responses! Hi Bob, first I want to thank you for all the Youtube videos and this blog. It has really helped speed up my learning curve on chukars since moving from Tennessee to Bend earlier this year. A very timely post on traps, since on January 31st my dog ran right through a snare that was placed not 200 yards from a main highway on an old overgrown two track that goes down into a river canyon. I couldn’t believe the placement of the snare, barely below the crest of the canyon and how long it appeared to have been there. To think that my dog could have that easily been choked to her death was enraging. My dad is a trapper back in Wisconsin, so it’s hard for me to exactly pick a side. I just feel like this particular setup was too close to a well used area. I have ran across a conibear years ago that was setup between strands of barbed wire while I was hunting pheasant on Iowa public land. I also had a dog get its toe caught in a leg hold trap that was set out in the open on a farmer’s land I was hunting back in WI. He was fine, but it was no fun getting the trap off of him. My dad was with me on the hunt and noticed that the trap was unmarked and in an open area which is against trapper’s ethics. In either case we all take on risk going out “there” but we just have to mitigate it and those videos from Idaho Fish and Game and much appreciated! Thanks for your comments, Ben. It sounds like you’ve had more than your share of trap crap. Knock on wood I’ve been lucky so far. How were the birds in the Bend area this year? Next PostNext What’s In Your Vest?